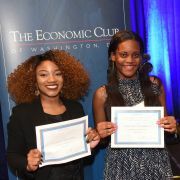 David M. Rubenstein Scholarship Program | The Economic Club of Washington D.C. The David M. Rubenstein/Economic Club of Washington, D.C. Scholarship Program is one of the few large-scale scholarship initiatives dedicated exclusively to students graduating from D.C. public and charter schools. Over the years, the scholarship program has steadily expanded. Inaugurated in 2008 as a one-year grant of $5,000 per student, funding increased in 2012 to $10,000 per student, paid over their first two years in college. The program doubled again in 2016 to an extraordinary total of $1,000,000 annually. As a result of this exceptional generosity, nearly 50 scholarships of $20,000 will be awarded each year to bright, motivated students who exhibit impressive academic achievement. If you have questions or comments about the program, please contact Linda Larson at scholarship@economicclub.org. Scholarships are awarded primarily for academic achievement. High school principals and the school’s nominating committee chooses the recipients. Only students enrolled in participating Washington, D.C. public schools and public charter schools are eligible to apply. Scholarship awards are presented every spring in a formal ceremony that award winners attend. Winners participate in the Scholars to Leaders Mentor Program beginning the summer after high school and continuing through college graduation. The program matches scholarship winners with alumni and Economic Club members who serve as mentors, providing consistent and meaningful support for student success. Scholarship winners also attend a series of seminars, which take place in the summer following high school graduation. Hosted by select Economic Club members, these seminars invite the students into the offices of leading local businesses for a day of informative education. Following successful completion of their sophomore year in college, students will be eligible to apply for our summer internship programs available exclusively to our scholars. Eligible applicants are restricted to students attending one of the DC Public high schools or DC Public Charter Schools listed in the Addendum. Applicants must be graduating seniors who have applied to a degree-granting program in an accredited college or university. Students must be enrolled full time as a high school student (enrolled for at least four credits during the student’s current and final year) at a participating DC High School. Students must graduate from high school with their class in June and plan to enroll full time in college no later than the fall following completion of high school. Students must be a citizen of the United States or be a U.S. lawful permanent resident (or have applied for permanent residence, the application for which has not been denied and intend to become a U.S. citizen at the earliest opportunity allowed by law). Students must have a minimum current GPA of 2.5 on a 4.0 scale or equivalent. Student’s transcript must demonstrate college preparedness such as AP/IB courses; honors courses; or college preparedness courses (seminars or other classes to help with college applications, SAT preparedness). Student must demonstrate interest and participation in extracurricular activities and community service. Leadership roles should be emphasized and are preferred. Students must complete the FAFSA and include a copy of the Student Aid Form with the application.